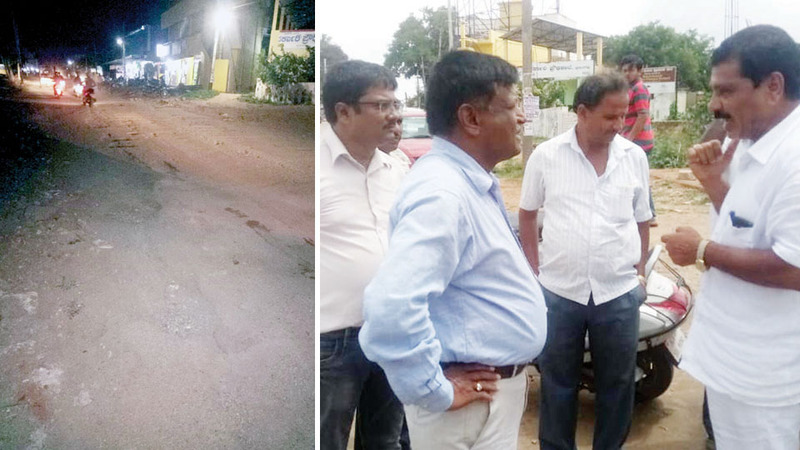 Mysuru: The villagers of Hootagalli have warned of launching an agitation if the quality of road works taken up by the Public Works Department (PWD) from Hootagalli Signal to KRS Road is not met. The 1,900 metre four-lane road work from Hootagalli Signal and the 300 metre two-lane road work passing through Basappa Road and touching KRS Road is going on at a cost of Rs. 5 crore. This includes the work on drainage, footpaths and shifting of electric poles. Already, the first stage of the work is going on near Hootagalli. However, social workers, Hootagalli leaders and the villagers allege that the quality of work is very poor. The villagers feel that the survey should have been done first and then the required space for the drain should have been left from the middle of the road. Since the work on the drainage has already begun, there is very little space left for the footpath. If the work is haphazardly finished, then it will inconvenience the pedestrians, the villagers said. “A lot of encroachment has already happened on this stretch. I have taken the details about the road development works under Right to Information (RTI) Act. The works should progress in an orderly manner,” said RTI activist Ravi. First the survey should be done and asphalting work in the middle of the road should be finished and then the drainage work should be taken up. If they continue with the work, then we will launch an agitation, he threatened. Reacting to the allegations of the villagers, PWD Assistant Executive Engineer Raju said that the road work has been taken up at a cost of Rs. 5 crore. The villagers are alleging that the government property has been encroached and we have informed the Revenue Department. The surveyor has already started the work. The work will be taken up in stages and now the work on the drainage is going on. The footpath work will be taken up after the Revenue Department gives its opinion, the he added. However, the villagers demand that the encroachment must first be removed as it would not be prudent to redo the work after succumbing to the pressures of the powers that be.